Many Americans have suffered an episode of back pain before the age of 30. 75 to 85% of Americans suffer from lower back pain once in their lifetime. 90% will improve with surgery. 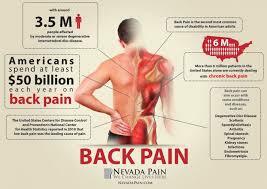 50% of people that have an occurrence of back pain will haven’t reoccur within a year. 5.4 million American workers were disabled for one more episode from lower back pain. 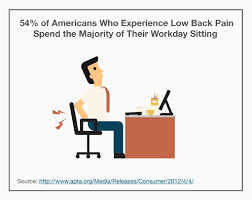 In the American workforce back pain is a common issue. Today more and more Americans are sitting in their jobs. This is probably the number one reason why many Americans have back pain. Also bad posture and being overweight has a lot to do with the stress it creates on your lower back. To minimize back issues. It is very important to have a exercise program that includes exercises that will help your lower back be stable, strong, and pain-free. As an at-home personal trainer who works with their clients in the Boca Raton and Delray Beach area. Many of my clients have back issues. Some are even not aware of it. Because they have never done any exercise or strenuous activity. Many go to the gym and start an exercise program on their own. Only to have a back issue materialize because of bad form, wrong exercises, and overworking the wrong muscles. As a personal trainer who specializes on helping my clients become pain-free. I always assess the whole body and try to figure out why my clients have pain during movement. In this case, when I find a problem with the back such as weakness or instability. I will have them incorporate a few selected exercises to help my clients regain the proper function of the lower back. Here are some tips that can help a client with a back issue. Walking is one of the best exercises for people who have back problems and pain. Walking helps to align the muscles properly and can help with back pain. There are proper mechanics to walking. Which a knowledgeable personal trainer can demonstrate to the client. Walking is a very passive form of exercise. This way the body gets proper movement. Relieving the client of back pain over time. Also many people have back problems because they’re walking mechanics are not properly performed. Seek a qualified personal trainer. In an exercise program. People that have back problems are advised to perform 2-3 exercises that can help them when a healthy back. Here are some back exercises. A. Hyper extensions on the stability ball. 2 sets of 10 repetitions B. abdominal crunches on a stability ball. 2 sets of 10 repetitions. C. Lying glute Bridges. 2 sets of 10 repetitions. D. Hamstring stretches and Psoas stretch 2 sets each for hold for 3 seconds, 10 repetitions E. Planks 2 sets of 10-15 seconds holds. performing the simple exercises can go a long way helping someone maintain proper back health. Along with an exercise program that works all the other major muscles and stabilizers. A general fitness simple and effective strength training program makes all the difference in staying pain-free. Whatever your fitness goals are from weight loss, strength training, endurance work or general fitness. Maintaining a healthy back will keep you on the track to achieving your goals.